Saving Money at the Grocery store and Living the Frugal life! I went shopping today with my money-maker coupons. (KY) For each one I get about $1 in overage to spend on groceries. I try to use this overage mostly on items I don't have coupons for, so meat is the item I tend to stock up on with these. In light of how little I got with my "free" $40, I can't imagine how high my food bill would be if I just shopped "normally". I went in search of a couple of deals today and found some extra deals along the way. I hit the commissary to look for coupons and get some crackers. They have cheese-nips for $1, Wheat thins for $1.99, and Ritz for $2. They also have displays with booklets in them with coupons for $1/2 Nabisco crackers and $1/2 Ritz. I had a few tearpad coupons I had found before New years that were for $2 off Ritz too which made them free. My dad had wanted some wheat thins, so I got him 2 of those with the $1/2 coupon for $1.49 each and the cheese-nips for $.50 each. Then I found this awesome coupon on the shelf in front of the Kool-aid and Country-time canisters. It is $3 off 2 Kraft beverage products (excluding single kool-aid packets) and 1 Kraft food product. I grabbed one, but the canisters were all $2-$3 and up. I walked down the aisle to check capri-sun and found the kool-aid bottles were $1. So I grabbed 2 of those and went off to look for a kraft food product. The mac and cheese was $.99 and the stove top was $1. So I got all three for free! I went back and grabbed more coupons and loaded up my cart with 20 kool-aid packs and 10 food items and checked out again paying $.35 for them all! I have more coupons, so I will go back this weekend and do it again. Then I went to Walgreens for the boost deal. I got 4 for $5 after my coupons and RR from last week and got $5 back. I picked up some Christmas m&m's for $.23 each and found half gallons of milk for $.50 each! It was a pretty good deal hunting day. Safeway has a pretty good deal right now for Kellogg's cereals. At first, it doesn't seem like a great deal, but combine a few different deals to make it GREAT! Now, your cereal is either $1.49 each (with $.70/1 corn pops or Raisin bran printable coupons), $1.74 each, or $1.99 each with $ off 2 coupons. Not a super price for cereal yet. But, look for the boxes that have the cars promo on it. For every 4 codes you put in online (1 code per box), you can get a $5 gas card (visa pre-paid card). So, you have now paid from $7.45-$9.95 for 5 boxes of cereal and you will get $5 back in a visa/gas card and a free movie ticket. Good Deal!! Buy some of the cereals that cross over and you can now send for a rebate with 10 upcs. GREAT DEAL!!!!!!! This is our produce buy for the week. I shop on wednedays at the hispanic markets for produce as they have the best prices and wednesdays they have produce specials. I am almost exclusively buying my produce here now or price matching at walmart. We got 43 lbs of produce tonight including apples, cantaloupe, grapes, strawberries, onions, tomatoes, lettuce, mangos, and peaches. We also got 7 lbs of rice and 15 lbs of meat(pork chops and whole chickens). We paid @ $38 for all of this with $20 of that being the meat. We will have to get more meat and still have oranges to get, but with 10 people in the house, this will last us about a week, maybe a few days longer, but we will be buying more next Wednesday. 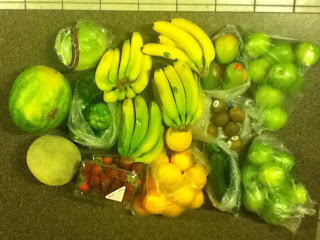 Though this is a coupon blog, it is rarer these days for me to get free produce with coupons, so this is the way to go. And since my huge stockpile of free boxes of rice is gone now, I will also be buying rice here until I can get it free again. I am paying $1 for 3-4 pounds of rice when it is on sale instead of $1.50 for one pound at Fry's. No matter how hard I try I can't seem to keep a good stock of toilet paper around here. I did have a stockpile for TP at one time, but now it just goes so fast. Tonight, we were down to one roll, between three bathrooms. I panicked. I didn't want to run out and just pay for toilet paper. Then I remembered that CVS had these 1000 sheet rolls this week for $.50 each. I also remembered that the sale ended in about 30 minutes when the store closed. Oh, and I had a $5 ECB in my purse. So I jumped in the car, got to the store and grabbed 10 rolls. I handed over my ECB and $.47 tax and walked out relieved. The TP crisis was averted for another week. This is part of my shopping trip tonight. I did not use any coupons, but still got some good deals. Wednesday is produce day at the Mexican Markets here-Food City, Pro's Ranch Market, El Super. On Wednesday's they have specials on fruits and vegetables. While there are coupons on produce sometimes, this is one of my favorite ways to get deals on fruits and vegetables. If you can't get it free, you look for the lowest price you can get. If you are not a subscriber to the AZ republic already, here's a good deal for you. You can get the Sunday and the Wednesday paper for $9.28 for the first 3 months and get a $25 Target gift card when you sign up! That's about $2.14/week, so it's about the same as what you'd pay in the store for a Sunday paper (with tax), but you also get the wednesday paper too. If you count in the value of the Gift card, you're only paying $2.84 for 3 months worth of Sunday/Wednesday papers. A great way to get some free coupons! 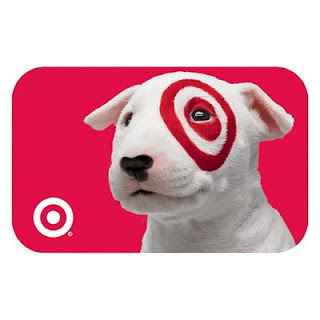 You can sign up here through April 15: AZ Republic Free Target Gift card deal. Use Reference Number: 3351467 to get the deal. Their are many sites like groupon now. Buy with me is one of those sites and right now, they have a deal for AMC movie tickets. You can get 4 tickets for $6 each or $24 total. These are silver tickets, so are not good for the movies when they first come out. You can see a movie at AMC any weekday before 6pm for $5 and on Friday, Saturday, or Sunday before noon. But if you want to see a movie outside of those time-frames and it's not a new movie, this is a decent deal on movie tickets. These can be used at any AMC, Loews, Cineplex, or other affiliated THeater, but shipping is only available to RI, NH, NJ, NY, CT, MA, DC, VA, TX, WA, CA, AZ, IL, WI, PA, MD, GA.
You can sign up here: Buywithme and then look in the Phoenix deals for the AMC tickets. I am a mom to 7 kids, a bargain hunter, and a couponer. I am always looking for the best deal on everything and I hate full price! I don't like to cook very much, so I am always looking for easy meals to make and I LOVE my crockpot! I don't make gourmet food and my meals are nothing special, but they ARE cheap and they are easy! Pinching Your Pennies-Has a GREAT local forum for Arizona with shopping lists for all the grocery stores and it's FREE! If you are in Phoenix, I run a coupon group on the west side. Come join us for free. Some of the terms I use in this blog may be unfamiliar to some people. So here's a list with definitions. If you see something else you don't understand, let me know and I'll add it. -RR are Walgreen's register rewards. They are coupons that print at the register that you can use on almost anything on your next order. -Winetags or WT are coupons found on wine bottles or displays. Some do not require you to purchase wine to use the coupon. -NWPN-mean "no wine purchase neccssary" refers to winetags.